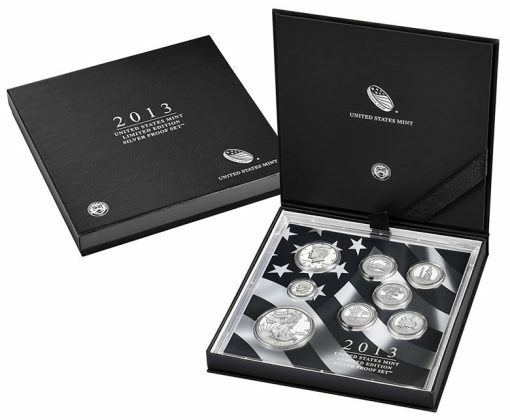 Today, Dec. 12, 2013, the U.S. Mint opened sales for its eight-coin 2013 United States Mint Limited Edition Silver Proof Set. It’s a second annual release with the first set debuting Nov. 27, 2012 and selling out April 24, 2013 with sales of 50,169. This year’s set has the same 50,000 mintage but launched $10 cheaper at $139.95. 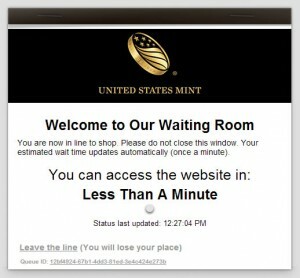 Demand is expected to be solid today and there was sluggishness on the U.S. Mint’s website in the early going with the Mint eventually toggling on its waiting room option. Last year’s set notched sales of 19,290 during its first six days. The U.S. Mint’s website was busy soon after the sets went on sale. The Mint soon turned on its waiting room feature to control traffic, giving customers the option to wait or come back later. "Improved for 2013 to better secure the coins in the set and protect the lenses." Coins of the set are not exclusive to it. The same 90% silver coins are found within the Mint’s annual 2013 Silver Proof Set, which also has another 7 clad coins. 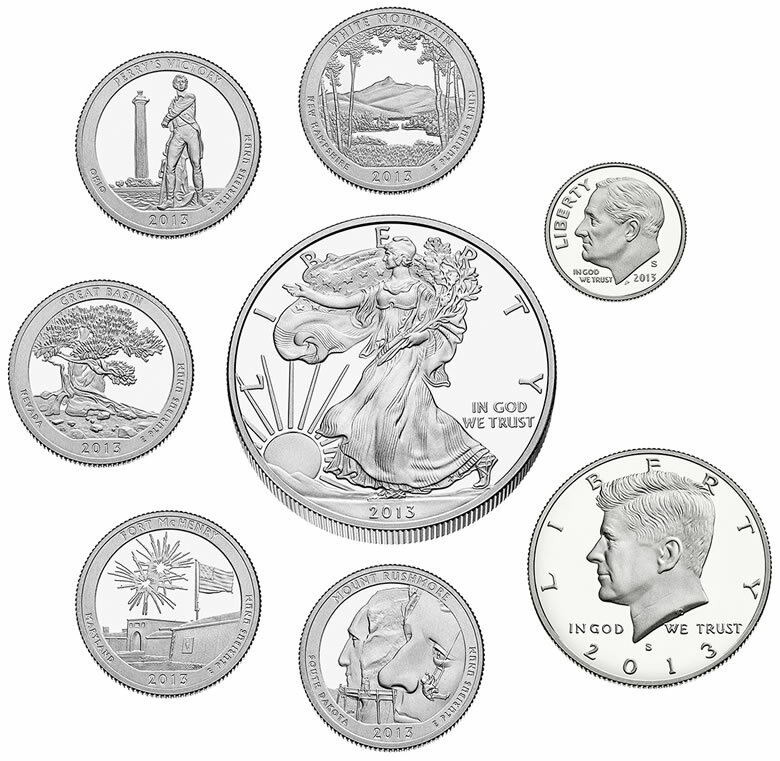 The five 90% silver 25-cent pieces are also within the annual 2013 America the Beautiful Quarters Silver Proof Set. And of course, the one-ounce proof Silver Eagle was available individually this year until it sold out on Nov. 12, 2013. It is also within the 2013 Congratulations Set. Here’s a quick summarization of these products, their sales as of Dec. 8, and their melt value based on today’s London Silver Fix price of $19.80 an ounce. Collectors not interested in the Limited Edition Silver Proof Set’s presentation case can get the same coins, plus 7 more in clad, cheaper by ordering the 2013 Congratulations Set along with the 2013 Proof Set. Prices for these two products sum to $108.90, which is $31.05 less than the cost of the set. Sets may be ordered by visiting the United States Mint website at www.usmint.gov/catalog or going directly to its online product page. Domestic customers will receive free standard shipping, saving $4.96, if an order is placed online before 5 p.m. ET on Friday, Dec. 13, 2013. Those not interested in saving on shipping can also order by calling the Mint’s customer service line at 1-800-USA-MINT (872-6468). There are no household ordering limits. Well, normally I like sets with a limited quantity, such as 50,000. But at this price I will pass. So all of you who bought this set can tell me a few years from now what a blunder I made. I’m with you Kevin NOT AT THIS PRICE! OK for all you collectors last years limited Edition proof sets are selling for a average of $185.00 but the kicker is if you held on to these sets and kept them in the original us mint brown box. (unopened) and sent them to PCGS for grading the label would say limited edition all coins in this set with the limited edition label are selling $400 to $500 for a PR69 not a perfect coin. if you were lucky enough to get a pr70 some were selling for over $5000 So this year I purchased 50 sets and they are all going to PCGS for Grading. Dont miss out !!! The 2012 sets that cost $149 a year ago from the Mint go for $260 to $280 on Ebay. How is that possible? How do I send a coin to pcgs for grading? Steve, i’m with you, why are the 2012 sets consistently selling on eBay for over $300 and most of them close to $400. I can’t figure it out and am trying to decide if at this time next year we’ll just be kicking ourselves for not buying the 2013 prior to the sell out (I think there are only 3000 left). I’m new to collecting but went ahead and ordered the 2013 set. I know you can piece together the same coins cheaper but just looking at what the 2012 sets are doing I went ahead and took a chance.